in Battesti Vincent et Ireton François (dirs), L’Égypte au présent, Inventaire d’une société avant révolution, Paris, Éditions Sindbad - Actes-Sud, coll. La Bibliothèque arabe, p. 15-28 [ISBN 978-2-7427-9780-6]. See this book L’Égypte au présent, Inventaire d’une société avant révolution. This is the translation and transcription (with Safa Dahab) of a discussion recorded unexpectedly in a taxi in Cairo, February 15, 2007. I was seating in the backseat of a decrepit specimen of the indefinitely fleet of black and white taxis of the capital. The taxi took another client, as often happens, who moved to the front. The conversation began between the client and the driver and lasted ten minutes in the usual traffic jams rumor. This article has been read 2071 times. Dernière mise à jour de cette page le Thursday 16 June 2016 à 12:46:22. //// -----> Citer cette page? 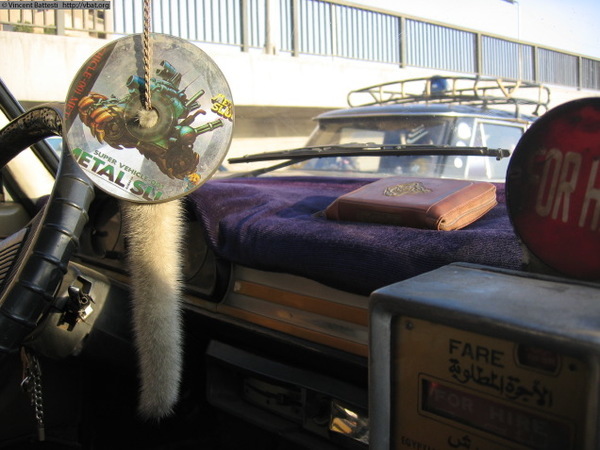 Vincent Battesti, Safa Dahab, "Prelude: conversation in a Cairo taxi" [en ligne], in vbat.org anthropoasis, page publiée le 4 May 2011 [visitée le 13 April 2019], disponible sur: http://vbat.org/spip.php?article571.